Ideally located in Lausanne-Vennes, just off the A9 motorway, the hotel is at the intersection of the north-south road axis. Easily reachable by public transport, it enjoys direct access to the M2 Metro station which is situated just below and permits direct connections to the city center of Lausanne and Lake of Geneva. In 2017, the platform AQUATIS will inaugurate the Aquarium / Vivarium & The Water City. With its location, 143 comfortable rooms, fitness, restaurant and meeting rooms. 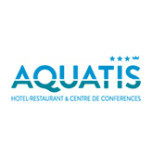 Aquatis Hotel *** S & Conference Center will be a key destination for both vacation and business trips.